Disclosure- I was invited to attend the Techlicious and TravelingMom Holiday Tech and Travel Show at no cost, and received many products for free for the purposes of review. All opinions are my own. 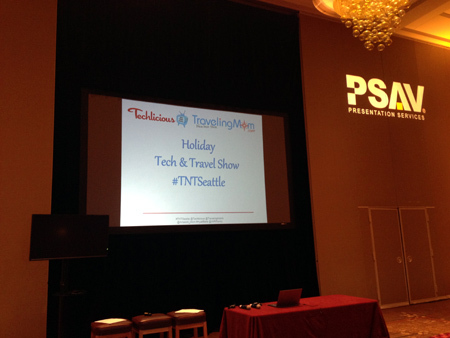 Last Thursday I had the amazing opportunity to attend the Techlicious and TravelingMom Holiday Tech and Travel Show, also know as #TNTSeattle! This was a holiday show, and frankly it was in many ways just like Christmas! It was absolutely wonderful to meet new people, get travel tips I haven’t seen before, and let me tell you the swag was incredible! So, where do we start? The event was MC’d by Kim Orlando of TravelingMom and Suzanne Kantra of Techlicious. I’ve followed Kim Orlando on Twitter for some time, and it was an absolute pleasure to meet her. Prepare books and movies ahead of time. Each person loads a book or movie for someone else in the family. Create a road trip scavenger hunt; who can find the cheapest gas station? Local diner? Best hotel deal? Haunted houses? Weird facts? 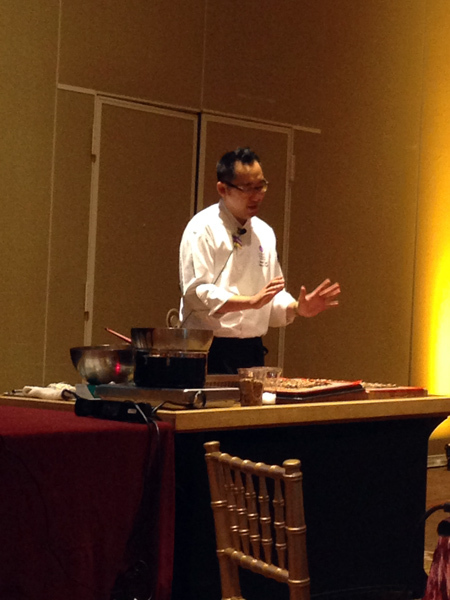 The event was hosted by Hyatt Regency Bellevue on the Eastside of Seattle. They spoiled us! The food provided was some of the best I’ve had in a long time. 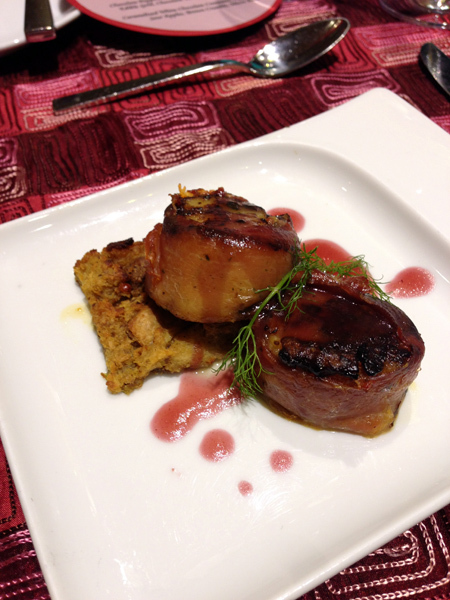 My absolute favorite was the first course of prosciutto wrapped scallops, stuffing crouton, and red wine pear glaze. I’m from Cape Cod and have eaten many scallops, including ones we caught ourselves. I have to say this dish was in the top 5. Really. The next course was heirloom tomato cup, mescaline green florette, herb goat cheese, toasted pecans with pumpkin vinaigrette. 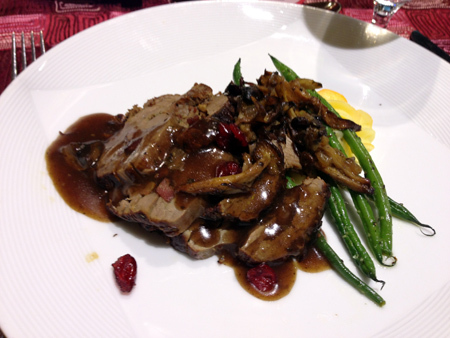 The main course was pancetta stuffed whole roasted beef tenderloin, sweet and yukon mashed potato, roasted mushroom and caramelized onion jus, and green beans. If I weren’t trying to be a lady, I would have licked that plate! Dessert was an honest treat. 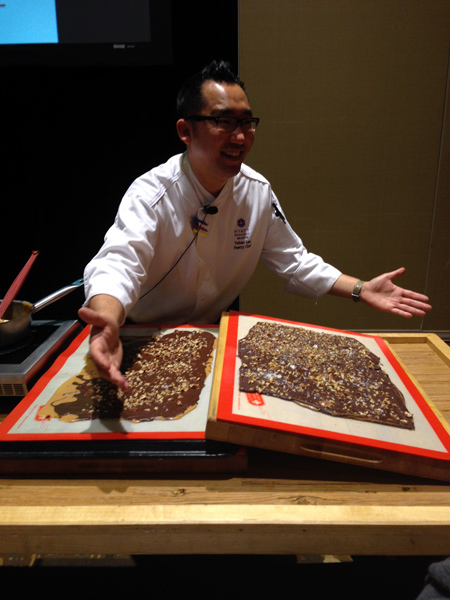 First, celebrity pastry chef Yohan Lee taught us how to make toffee. Now, I don’t like toffee, I never really have. I declined to eat any at the event. We were sent home with a bag of Chef Yohan’s toffee. My husband tried it, and basically told me I need to eat this. Holy cow, it was delicious! I was regretting everything I’ve ever said about toffee, and really regretting the fact that my husband had already eaten half the bag! 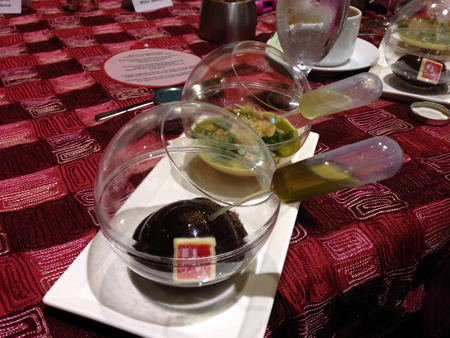 This is molecular gastronomy, no? I needed instructions on how to eat it! 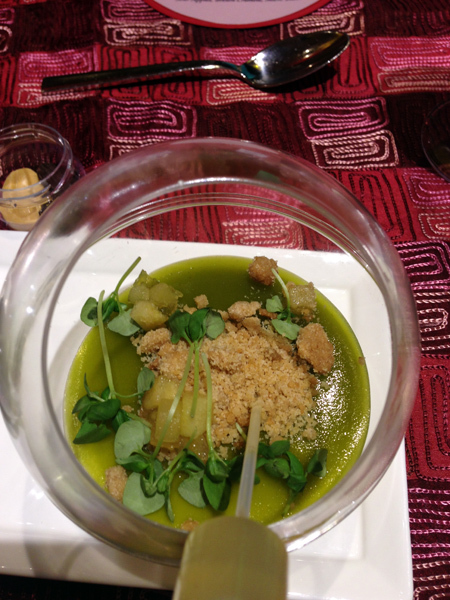 The first dessert was caramelized white chocolate cremeaux, apple gel insert, sour apples, breton crumble, and micro basil. To me, it was a highly elevated apple pie dessert, it was unexpected and delicious. 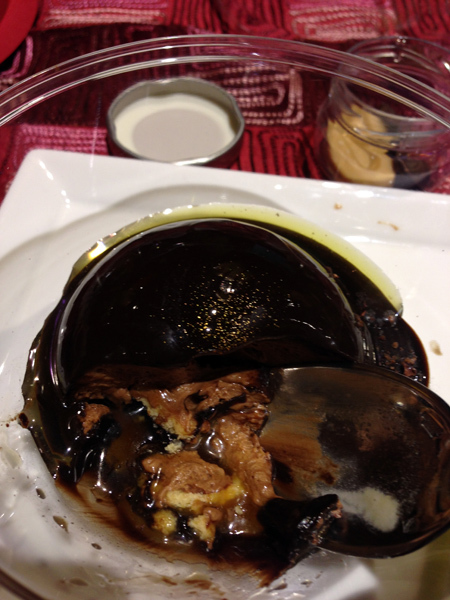 Next was chocolate peppermint mousse with shiny chocolate glaze, edible gold (yes! ), chocolate tarte, and caramelized cocoa nibs. 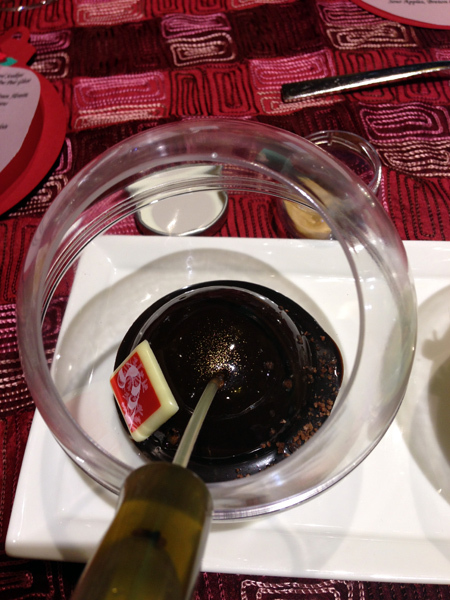 The texture was a lot like breaking into an egg, only a very delicious chocolate egg! Hungry yet? Me too! We were given gift certificates for breakfast, and let me tell you that I am very much looking forward to it! 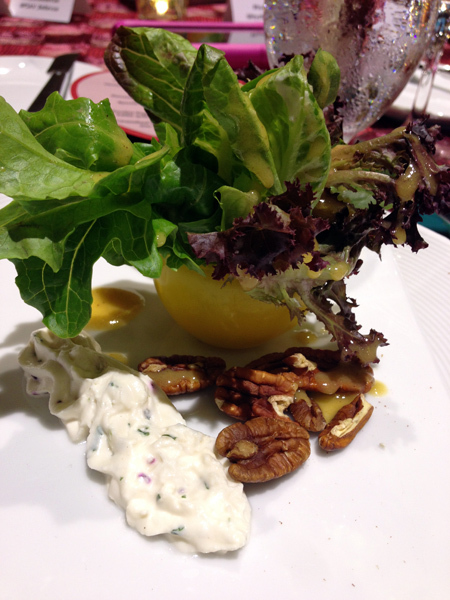 If you’d like more pictures of the wonderful Hyatt Regency Bellevue, check out this post. Amazon, Netgear, AT&T, and Omaha Steaks were also sponsors of this event. Everyone walked away with some beyond amazing gifts. 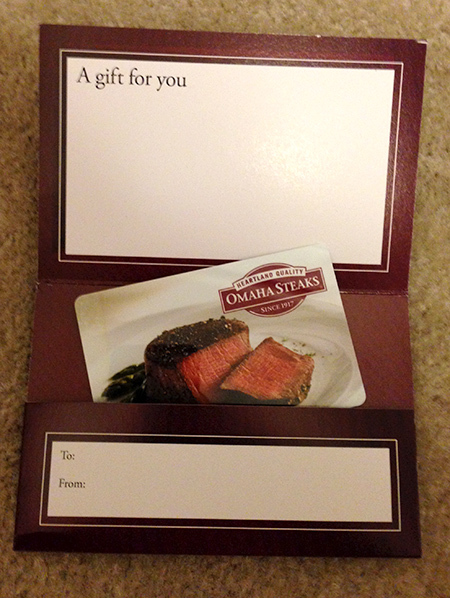 Hubby and I have been drooling over the Omaha Steaks catalog, negotiating who’s going to get what! I had their potatoes au gratin years ago, and I’ve been dreaming of it since. I can’t wait to try them again. Who knows, maybe we’ll have steak for Thanksgiving! 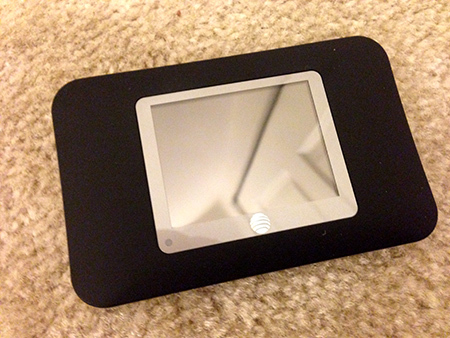 AT&T and Netgear teamed up to give us a Unite Pro Mobile Hotspot with a GoPhone gift card for service. It can actually connect up to 15 devices at once! 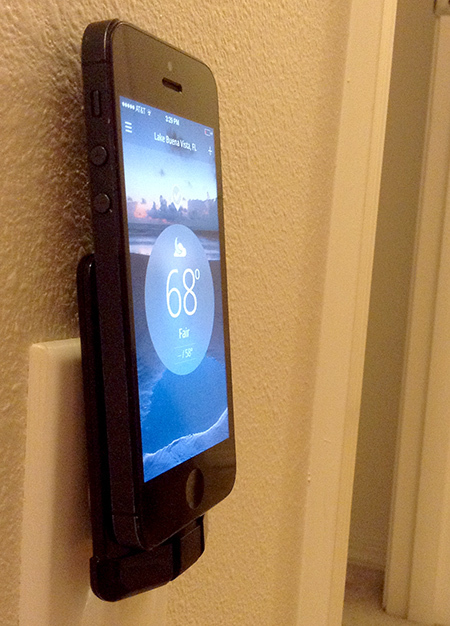 Next time we’re traveling, we’ll definitely hook this up and write a full review. Also very cool is the Thinium docking wall charger for iPod and iPhone. It folds down to a little larger than a business card, making it easy to fit in a small purse or charge behind a table. That’s my iPhone 5 for comparison. There’s a hidden USB cable too, so you can sync with your computer. I’ll definitely be taking this on my next trip. 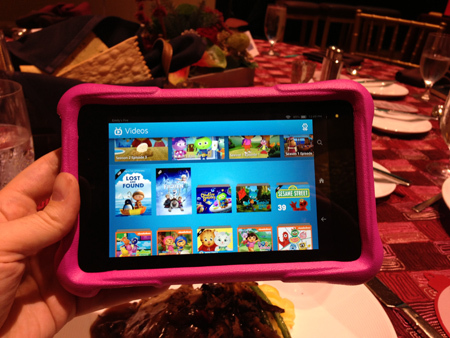 One thing I still can’t believe I’m able to give to my daughter is the Kindle Fire HD7 Kids Edition. She’s been playing with it for a few days, and I’m impressed. Read the full review, as well as a comparison with our iPad Mini here. 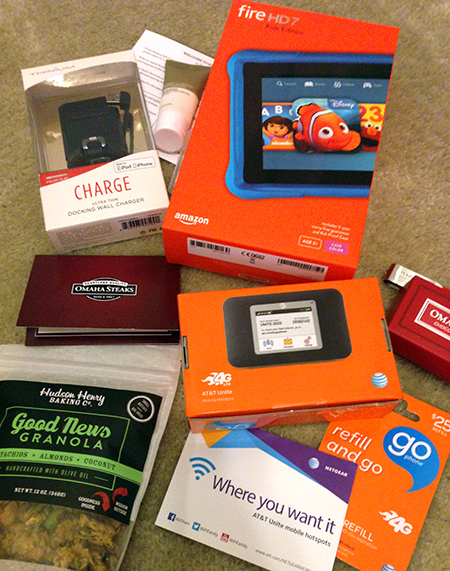 Overall, I’m so happy that I was able to attend the Techlicious and TravelingMom Holiday Tech and Travel Show, and grateful for all of the gifts we received. Kim mentioned there might be another event next year, and if I’m invited, I’ll be there with bells on! Again, thank you so very much to everyone who made this event possible. It’s greatly appreciated. Party Alert! Next Monday November 10th, 9-10pm EST there will be a Twitter party to celebrate the Techlicious and TravelingMom Holiday Tech and Travel Show. I hear there may be big prizes…. 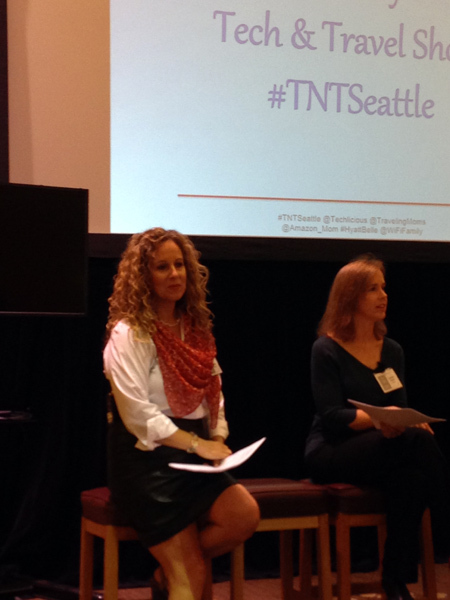 Follow hashtags #TNTSeattle and #TMOM and be sure to follow @TravelingMoms and @Techlicious. See you there! Disclosure- I was invited to attend the Techlicious and TravelingMom Holiday Tech and Travel Show at no cost to me, and received many products for free for the purposes of review. All opinions are my own.